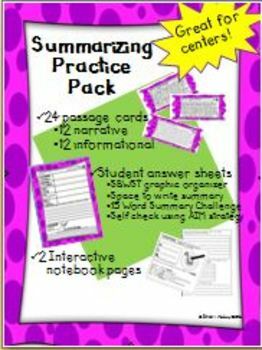 Looking for some passages your students can use to practice summarizing? This is a set of 12 cards with short passages of informational text, specifically written to include the main components of a great summary. The graphic organizer uses the SWBST (somebody,wanted, but, so, then) method to determine the five components of a summary. I have included a second version of the organizer that uses the terms "Character, Goal, Conflict, Attempts to solve the conflict, Resolution". 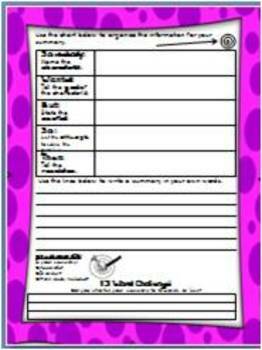 Also included in this pack are two interactive notebook pages. The first page explains that the information in a summary needs to be accurate, in order, and tell the main ideas. I've used the acronym "AIM" (Accurate, In order, Main ideas) with a visual of an arrow and target board to help students remember to check these crucial requirements of a good summary. The second IN page is a form I have used to help students pare down their lengthy summaries into shorter and shorter versions. -Whole group modeled guided practice - run multiple copies of the same passage to complete together. -Independent assignment - use the same passage for all students, or each student has his/her own. -Peer evaluations of summaries using AIM strategy. -The 12 non-fiction biography passages are great topics for further research and extension. The space on the cards only allowed for very limited information about these amazing people. ** I highly recommend having your students find out more details!